Hexxagon happens to be one of those games that's easier to play than it is to explain. 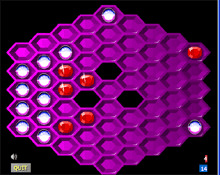 The game is very similar to Othello and it does not take too long to get it. Basically you have to own the board!